So, last week I featured A Bounty of Bead and Wire Necklaces to give away, and this week, our final week, it will be A Bounty of Bead and Wire Bracelets! Yay!! This volume is full of the same high quality projects as any Lark Publication: well-designed projects by well-known designers. The instructions are easily followed, and there are certainly more than enough included that you're bound to find many that you wouldn't mind having for your own...or making for gifts! Please make sure that your link will lead me to an email address, or else I won't be able to contact you. No contact, no win, and I simply have to go on to the next person. Deadline: December 24. I would love to win this book. Thanks. My e-mail is in my blogger profile. Just posted in my facebook group, Wire Work artists. I want to get back into beading. I just bought Nathalie's book about leather jewelry and I would like to add this book with it. Thanx for a chance. I tweeted about your Lark book giveaway. 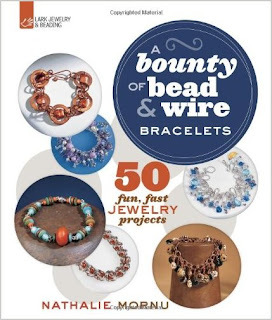 I would love to win this book about making bracelets. One can never have to many books, especially one like me 'addicted' to bead therapy. Thank you. I love making bracelets, I can often be more creative and still keep the time down, so I don't feel like I am giving it away. Looks like a really neat book filled with lots of inspiration! Looks like a fun book. Would love a chance to win. I would like to have a copy of this book. Thanks for the chance! I would love to win this book! Pretty please count me in! Thanks! This looks like a fantastic book and I would be happy to be the winner! Looks like a great giveaway! Thanks for the chance. I would love to win this book. I find that I am starting to make more and more bracelets and well ideas are always a good thing. I would love to have this book and learn some new designs.